On St. Patrick&apos;s Day, the saying goes, everyone is Irish. But in Boston, everyone really is Irish. Well, not everyone. But of all the major U.S. cities, we have the highest percentage of people of Irish ancestry. There really is no other place to be stateside to celebrate the holiday. You&apos;d certainly want to join the many spectators who will be lining the streets of South Boston for the annual St. Patrick&apos;s Day Parade on Sunday, March 16, 2014. It is one of the largest of its kind in the nation. Kickoff time is 1 p.m.
You may also want to plan your own parade of sorts and engage in an Irish pub crawl. Among the spots where you could sample some beer or whiskey from the old country is Ned Devine&apos;s Irish Pub at Quincy Market in downtown Boston. Another great way to celebrate the holiday would be to join a tour of the Irish Heritage Trail. Organized by the Boston Irish Tourism Association, the 90-minute guided tours explore landmarks such as a statue of President John F. Kennedy, the Boston Irish Famine Memorial, and the Old Granary Burying Grounds. Just in time for St. Patrick&apos;s Day, tours are scheduled for Saturday, Sunday, and Monday, March 15, 16, and 17, 2014. You can make reservations for the tours online. 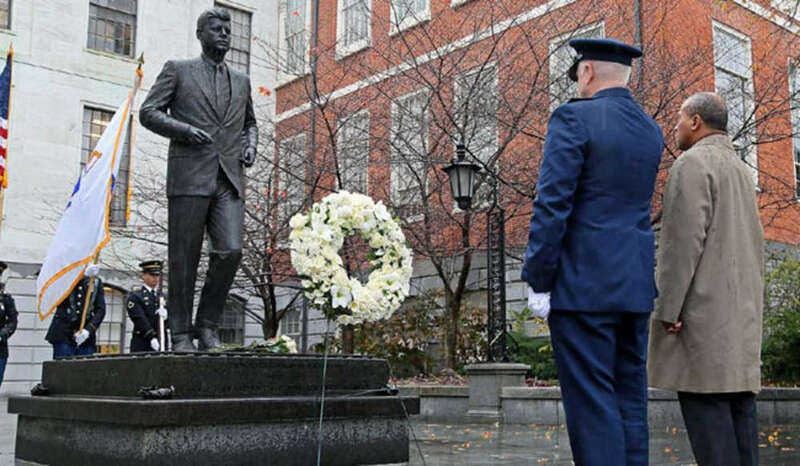 Photo: Statue of John F. Kennedy at the State House. Concord Monitor.